Fox News Host Laura Ingraham shared a public apology Thursday to Parkland school student David Hogg after multiple companies announced they were pulling their ads from her show, the Ingraham Angle. The apology, however, was “not enough” for Hogg, who called for the advertiser boycott Wednesday after Ingraham teased him about getting rejected from several colleges. We’d like to confirm that we are no longer advertising on Laura Ingraham’s show and are monitoring all of our ad placements carefully. Update: Expedia and Nestle are the latest to turn on Ingraham. “I will only accept your apology only [sic] if you denounce the way your network has treated my friends and I [sic] in this fight. It’s time to love thy neighbor, not mudsling at children,” Hogg tweeted Thursday afternoon, responding to a tweet from a Parkland parent who lost his daughter in the February 14, 2018, shooting. *Waits till we boycott her advertisers to apologize* wow. 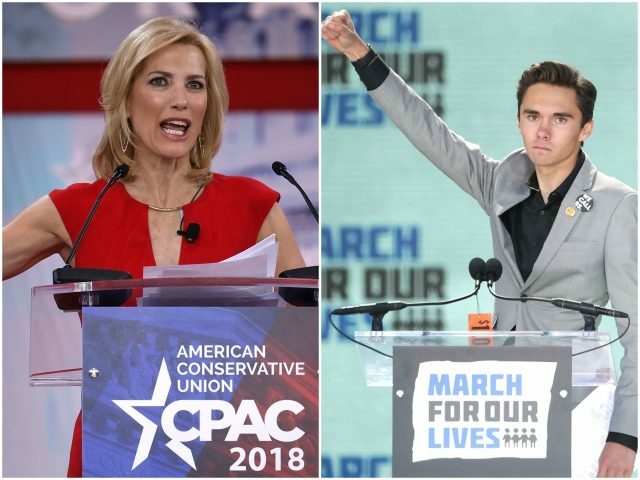 Her brother, anti-gun activist and Parkland school shooting survivor, David Hogg, had called for the advertiser boycott late Wednesday after Ingraham made fun of him online for getting rejected from several universities. Rachael Ray’s pet food brand Nutrish was the first company to announce it was removing its ads from the conservative host’s Fox News program. Just hours after Hogg asked followers to pressure advertisers to sever ties with Ingraham’s show, Nutrish tweeted that it was leaving. “We are in the process of removing our ads from Laura Ingraham’s program,” the company tweeted. Nutrish’s parent company, Ainsworth Pet Nutrition, did not respond to Breitbart News’ request for comment. The company also owns Better Than and Dad’s Pet Food brands. An email sent to Rachael Ray’s company received no response. A growing list of advertisers has since joined Nutrish: online home goods company Wayfair and online travel website TripAdvisor, followed later Thursday by Expedia and candy-maker Nestle. “In our view, these statements focused on a high school student, cross the line of decency. As such, we have made a decision to stop advertising on that program,” the TripAdvisor spokesperson added, according to CNBC. The first public company to join the boycott, TripAdvisor did not immediately respond to an inquiry from Breitbart News if this stance against a prominent conservative should be taken as a message to conservative travelers who might use its website. Later on Thursday, online home goods company Wayfair told CNBC that it too plans to stop advertising on Ingraham’s program over the tweet. “As a company, we support open dialogue and debate on issues. However, the decision of an adult to personally criticize a high school student who has lost his classmates in an unspeakable tragedy is not consistent with our values,” Wayfair’s head of public relations, Jane Carpenter, told CNBC. “We do not plan to continue advertising on this particular program,” Carpenter said. Expedia and Nestle were the latest companies to turn on Ingraham. “We have no plans to buy ads on the show in the future,” a Nestle spokesperson told CNBC. A similar boycott campaign was run against corporations affiliated with the NRA after the Parkland school shooting. Over a dozen cut ties with the gun rights organization within 10 days of the tragedy. When asked for comment, a spokeswoman for Fox News directed Breitbart News to Laura Ingraham’s tweet apologizing to Hogg. Ingraham’s show, the Ingraham Angle, airs on Fox News at 10 p.m. eastern on weeknights.